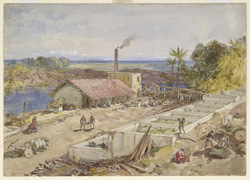 Watercolour of an indigo factory in Bengal by William Simpson dated 1863. The drawing is inscribed on the front in ink: 'Indigo factory. Wm Simpson, 1863.' This image is the original drawing for plate 38 of Simpson's, 'India, ancient and modern,' published in London in 1867. In the 19th century, Bengal was the biggest producer of indigo in the world. Indigo was treasured for its rich blue colour and because it was one of the most colourfast natural dyes. As seen in this image, the plants (Indigofera tinctoria) were soaked in large tanks or vats of water to release their blue colour, and would then float to the top to be retrieved and dried.